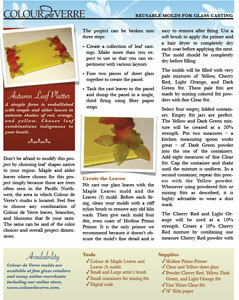 Learn to make this fused glass serving platter with detailed, life-like cast glass maple leaves. A perfect fall project. Download the free step-by-step instructions, project courtesy of Colour de Verre. Viewing these downloadable file requires the use of Adobe Acrobat Reader. If you do not have the free Adobe Acrobat Reader on your system, you may download Adobe free from their website.